A line of vacuum inlet traps used to protect vacuum pumps on research and production CVD (chemical vapor deposition) processes for the manufacture of graphene, carbon nanotubes, nano crystals, and molybdenum disulfide atomic layers is being introduced by MV Products of North Billerica, Massachusetts. MV Products Vacuum Pump Inlet Traps are sized to the high-vacuum application involving reactors, tube furnaces, and the like which produce fine carbon soot that can accumulate in the vacuum pump and cause premature failure. Available for systems from less than 1 CFM to over 1000 CFM, they feature 0.2 micron polypropylene filter elements and can be supplied with a variety of other filters for removing specific types of vapors and contaminants. 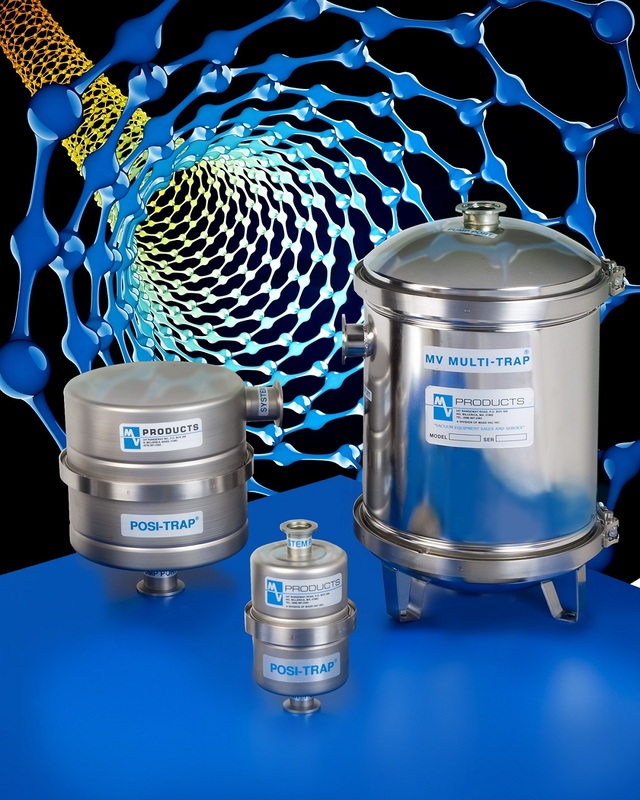 All filters are positively sealed to prevent blow-by and MV Products Vacuum Pump Inlet Traps include the PosiTrap® which comes in sizes to hold 1 to 4 filter elements and the MV Multi-Trap® featuring a stainless steel knockdown stage and up to six separate stages; each holding multiple filter elements. The filters provide up to 99.9999% efficiency and are easily replaced. MV Products Vacuum Pump Inlet Traps are priced according to style, size, and quantity. Technical data and price quotations are available upon request. MV Products, Division of Mass-Vac, Inc.